When it comes to the number of websites to buy bitcoins, there are plenty. The real challenge is to find the trusted ones where you are safe, even after sharing your information & adding your financial details. This is why we here at CoinSutra test and research the best websites, tools, and guides regarding Bitcoin and other cryptocurrencies to help you stay safe. In today’s article, I’m sharing my experience & review of CEX.io. I started using CEX.io last year when I was looking for a place to buy bitcoins with a Visa debit card. Now I feel like I have enough experience to share the pros & cons of this upcoming Bitcoin & Ethereum exchange. 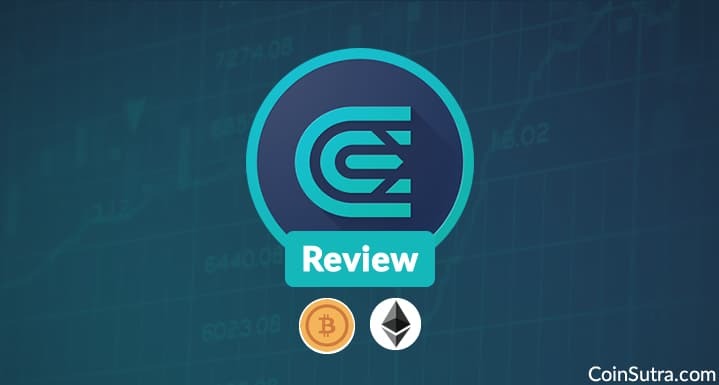 So without further delay, let’s get started with our detailed review of CEX. First of all, CEX is definitely a legit site that supports multiple currencies & locations. 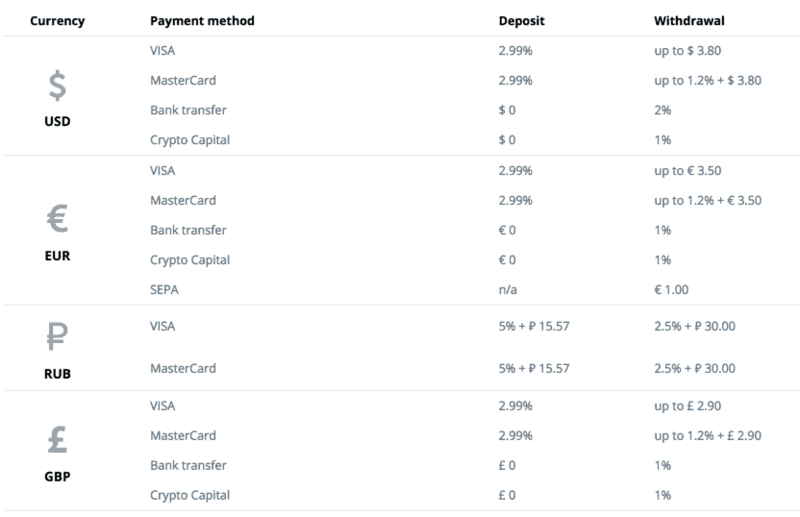 You can add funds using a Visa/Master debit or credit card, wire transfer, and Cryptocapital. Buy Ethereum using credit or debit card. They have also lowered down the deposit fees for credit/debit cards. Wire transfer & Cryptocapital deposits are free. Once you have created an account, the very first thing you need to do is get verified. If you are planning to buy Bitcoin using a credit or debit card, you can add the card by going to Deposit > Payment Card & adding a new card. You can add as many cards as you want, as long as they’re in your name. You need to take a selfie with the card. At times the compliance team might ask you to write down the date on a piece of paper & then take another selfie. If you have never done a KYC (“know your client”) for Bitcoin before, you might find it annoying, but after the first time, it’s ok. This kind of verification measure is taken by all popular exchanges to ensure the integrity of the exchange & provide us with better service. It can take up to 48-hours for a card to be linked to your account. Once you are done loading funds to your account, click on Buy/Sell at the top to start buying Bitcoin or Ethereum. You might notice the price of Bitcoin to be higher than the current price on other exchanges. This is because CEX takes a 7% fee for its service. Personally, I find this to be quite high, but at times (in desperate situations), it’s ok.
You can switch from BTC/ETH on the same panel. You can either buy bitcoins based on a fixed price (100, 200, 500, 1000) or you can add your custom price as shown in the above screen. Click on Buy and confirm the transaction. 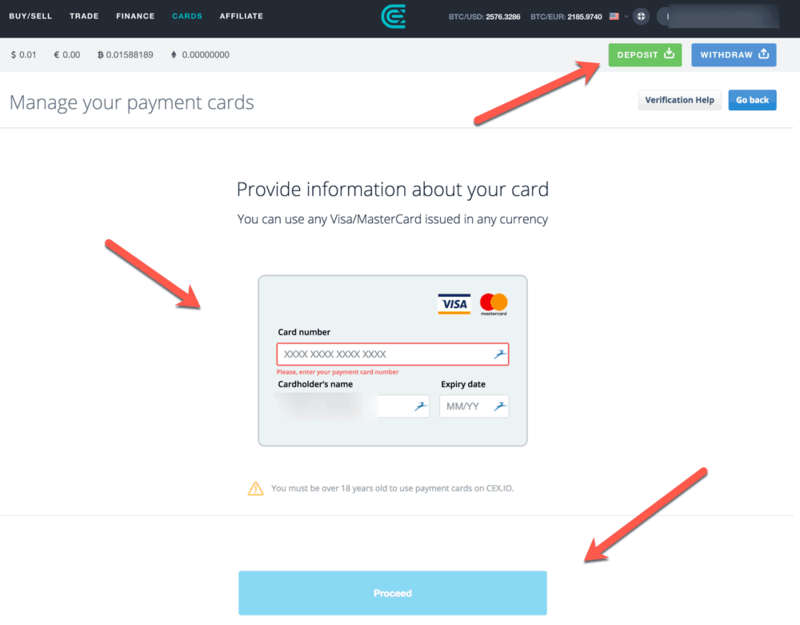 Your bitcoins will be credited to your CEX.io wallet immediately. If it’s a considerable amount, I would suggest moving those bitcoins to a secure hardware wallet like the Ledger Nano S. If it’s a small amount, then you can move it to a hot wallet like MyCelium or Jaxx. If you want to create a Bitcoin donation button, then CEX.io will also be able to help you. For this, you need a registered account so that the donation will be collected in your CEX Bitcoin wallet. CEX.io is a trustworthy website to buy/sell Bitcoin & Ethereum. The interface is sleek, new, and user-friendly. They have taken care of security, and the support is pretty amazing- one thing that is not so common in the cryptocurrency industry. The option to buy Bitcoin using your credit & debit card is one of their most used features, even after the 7% fee. I would love to see them lowering their fee in the coming days as I think this would get more people excited about their service. Since they support many countries, it’s an advantage for users from countries where it’s not so easy to buy Bitcoin. 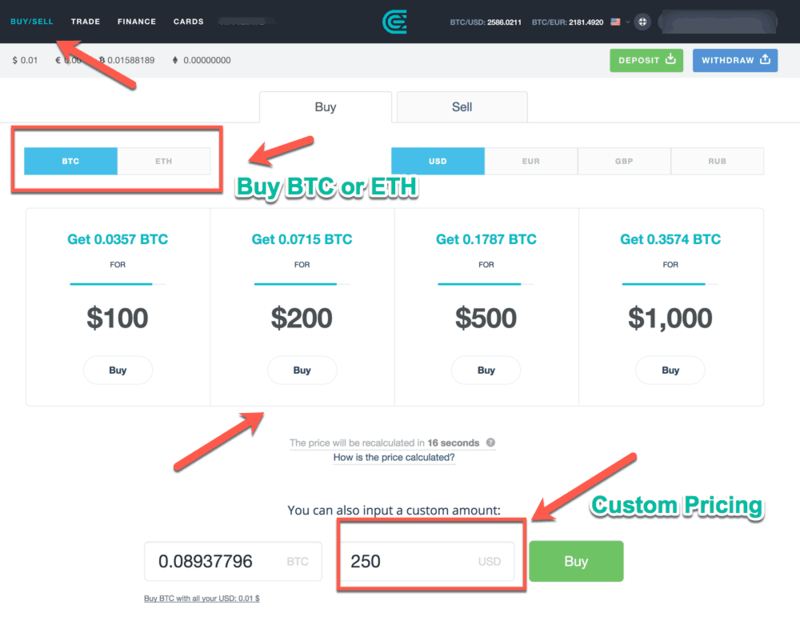 Have you used CEX for buying, selling, and/or trading BTC/ETH? How has your experience been? Let us know in the comments section below. Want me to review any other website that sells Bitcoin? Let me know in the comments. What about selling? 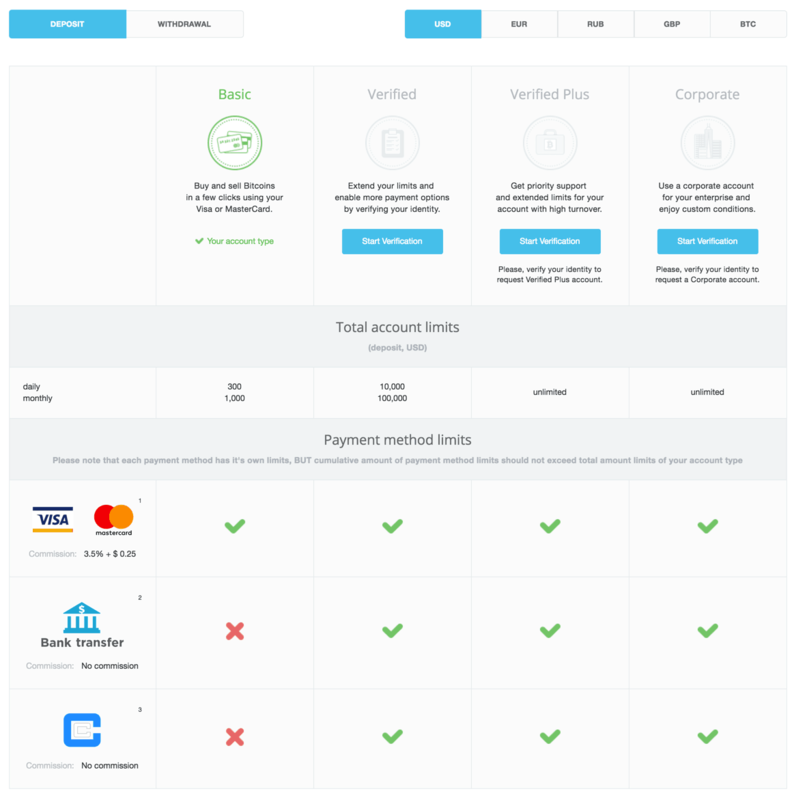 Is there any problem in receiving money from CEX.io to your Indian bank account? You can sell and keep your profits in Fiat. Currently not possible to link your Indian accounts here so no question of getting a Fiat withdrawal in your Indian Bank account. i have bought some bitcons by cex.is. do i need to transfer in bicoin wallet ??? what if i dont transfer in wallet and keep it in CEX.in? is ther any wallet you suggest ? If you don’t transfer you stand at the risk of losing BTC if CEX goes down. I recommend Ledger Nano S or Mycelium for a Bitcoin wallet. Ledger is much safe than any other. how can we transfer BCT and ETH from CEX to other wallet ? By simply going to withdraw or send section and put there your BTC and ETH addresses in the wallet where you want to send respectively. Why not include other Cryptos (incl. ETH) on CEX.io rather than Exclusively focus on BTC, both in terms of wallet and in terms of fee structure? Sure will update in some time. Hi ..You mentioned about 7% fee if we use “Buy/Sell” module. 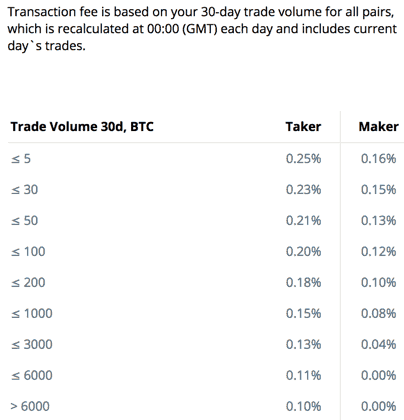 However if you use “Trade” module, fee charged is minuscule 0.2%. I am intrigued by this difference. is there a technical difference? would i not be better of using “Trade” function? Nice spot and let me also check and will update the article accordingly. how much does cex charge at card vrification? Hi Harsh, please suggest if you were able to research on this. would love to see answer asap. Is there any transaction fees to transfer my ether from cex to hardware wallet. ? what wallet do you recommend for XRP and multiples cryptos ? I did use CEX and was wonderful, but Ive mutiples coins, and Blockchain doesnt have support for many of my coins. You can sell at Koinex, which is an Indian exchange. Meanwhile, I never had the issue with Cex withdrawal (Cryptos), haven’t tried the card withdrawal as I believe that’s limited to USA, Europe, and few countries. We are sorry to inform you that withdrawals to VISA/Mastercard cards are blocked in India. As a workaround, please be informed that you can use bank or Crypto Capital transfer to withdraw your fiat funds. Thank you for understanding on the matter. Doesn’t Foreign Exchange Management Act(FEMA) prohibit Indians from trading on foreign exchanges? As Indian law considers anything apart from INR as ‘foreign’, is buying from cex.io also prohibited under FEMA? You write about 7% fee for purchase of BTC, but maybe you could have written about the fee (structure) for other coins such as ETH too? If the fee for ETH is lower/none, then I would say that is quite relevant. Support is busy with pending tickets. Please wait or contact them again. This happening everywhere. Can I buy ETC on CEX? hello, how to deposit btc on CEX? Hello, can I use Cex to sell monero? or what other platform you recomends me?